Michael Mills giving an accep­tance speech at the 2018 Charger Hall of Fame Cer­emony on behalf of the 1969 football team. facebook. The 1969 Hillsdale College Chargers were in the thick of their football season. It was October. Playoffs would soon be approaching and with Frank “Muddy” Waters as the head coach, expec­ta­tions were high. But it was in October junior defensive Michael Mills thought he’d never again see his coach, his team­mates, or anyone else for that matter. On Oct. 7, 1969, Mills suf­fered a trau­matic brain injury during a game and was pro­nounced dead on the field against Northern Michigan Uni­versity. He was rushed to St. Luke’s Hos­pital in Mar­quette, Michigan, where doctors attempted to rescue him. While his body was present, Mills’ spirit was not. He spent 22 hours in Heaven, where Jesus told him his journey wasn’t fin­ished. From there, the mir­acles unfolded. As Mills returned to his physical body, he dis­covered he was par­a­lyzed from the neck down, and he lacked all of his senses, except for hearing and speaking. He could neither see nor feel any­thing, but he could hear, and soon, he heard words of comfort and concern from his parents and coach. “I boldly pro­fessed to them that I was going to walk out of the hos­pital in 38 days! That is what the Lord had told me!” Mills wrote. It took four days for the proper staff and equipment to be assembled for the ensuing oper­a­tions Mills would endure. On Oct. 11, brain surgery finally began. Despite some com­pli­ca­tions, the oper­ation was suc­cessful and Mills recovered well. Mills was on track to walk out of the hos­pital in 38 days. “Every morning when I wake up — and I mean every morning for the last 50 years — I have put my feet on the floor and thanked the Lord for the day in front of me and asked him what I’m doing for him today,” Mills said. God has used Mills in dif­ferent ways since his new life began. Whether he was working in ath­letics or pol­itics, Mills keeps two things at the center of every­thing: his faith and the prin­ciples he learned during his time as a Charger. He returned to Hillsdale in the fall of 1970, but this time not as a student-athlete. To replace the time he would have spent on the football field, Coach “Muddy” Waters appointed him to be the college’s first full-time sports infor­mation director. He also served as sports editor of The Col­legian, majored in business and eco­nomics, and afterward worked in college ath­letics for 30 years. 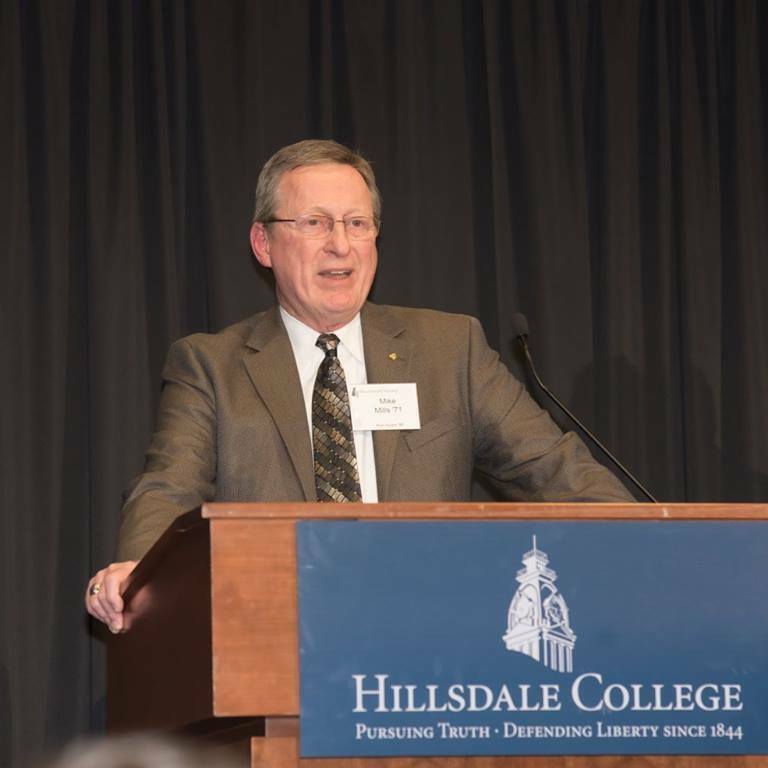 After working at The Col­legian, Mills worked for the Hillsdale Daily News as the sports editor, but not for long. By 1974, Waters was being recruited to found the ath­letic program at Saginaw Valley State Uni­versity and he wanted Mills to help him. Of course, Mills said yes to the job. From there Mills trans­ferred to Col­orado State Uni­versity to be the assistant ath­letic director and teach a jour­nalism class. Mills said one of his jobs was to figure out how to sup­plement funding for women’s sports after Title IX required col­leges and uni­ver­sities to finan­cially support men’s and women’s sports equally. Mills not only learned business and eco­nomics at Hillsdale, but his job as the sports infor­mation director taught him to com­mu­nicate. Hillsdale’s current sports infor­mation director Brad Monas­tiere said the ability to com­mu­nicate is the most important thing his job has taught him. For Mills, his ability to com­mu­nicate led to many more oppor­tu­nities. He was a pro­ducer and director of radio broad­casts statewide and was able to increase revenue for the NCAA by $250,000. It was also at Col­orado State where Mills ran the NCAA Final Four tour­nament in 1979 when bas­ketball legends Magic Johnson and Larry Bird faced each other in the finals. Like Muddy, Van Eaton encouraged Mills to be a man of good faith and char­acter. After his deadly expe­rience on the football field, Mills says Hillsdale is one of the only places he could imagine allowing him to share his story. He said God pro­vided a way for Mills to use his expe­rience in October 1969 for a greater purpose. Former MLB pitcher for the Dodgers Carl Erskine worked with the Fel­lowship of Christian Ath­letes orga­ni­zation and invited Mills to speak to a group of injured ath­letes and their parents. According to Mills, Hillsdale College and Charger football gave Mills his start, his story, and his smile. It is because of this special place and those special people Mills has enjoyed this life journey. “They’re like brothers, and Muddy was like dad,” he said. This special team was inducted into the Hillsdale College Sports Hall of Fame in 2018. Mills is now cur­rently working as a chaplain at the Huron House in Port Huron, Michigan. Each day is a new chance for Michael Mills to live the life he thought he’d never have again, and he is living it with full faith and a great purpose. What an amazing story. I missed this article when it was first posted, caught it on the rebound. Great writing!